The Malaysian island destination of Langkawi is a much-favored vacation hotspot. Known for its many attractions like pristine beachfronts, imposing man-made sights like the Langkawi sky bridge and the Langkawi cable car, aquariums, water parks, and a bounty of duty-free shopping options, the island aims to cater to all tastes and preferences. However if you enjoy deviating from the trodden path and enjoy discovering the relatively unexplored, you will be happy to know that Langkawi offers much opportunity for such explorations as well. Suggested below are some of these interesting if not unusual expeditions. 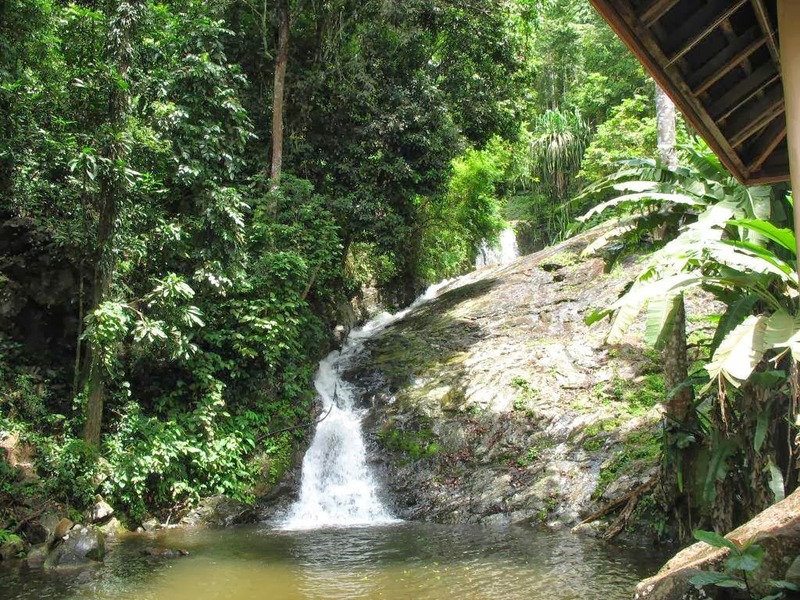 Legends and myths abound in Langkawi, one such legend says that beautiful fairies come to bathe in the dancing waters of the Telaga Tujuh waterfall, also known as the Seven Wells waterfall. 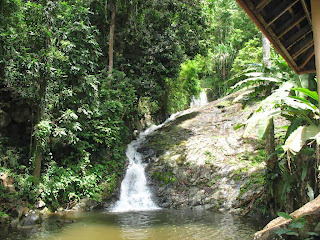 These falls are located close to the island’s Telaga Harbor, a popular mooring site for luxe yachts visiting the island. The land around the falls is littered with several seemingly mysterious limestone formations and caves adorned with ancient writings. The tomb of Mahsuri Makam is an attraction located within the Langkawi village of Mawat. The attraction features a marble crypt, which contains the mortal remains of Princess Mahsuri, a maiden of Siamese origin. The legend states that Mahsuri married a local tribal chief and was loved and respected by everyone. However, her mother-in-law was insanely jealous of her beauty and went on to unjustly accuse Mahsuri of adultery. The beautiful maiden was then sentenced to death but at her execution, she amazingly shed white blood to the surprise of the onlookers who were then immediately convinced of her innocence. As Mahsuri lay dying, she cursed the island of Langkawi saying it would be barren for the coming seven generations. This as we know did not happen for the island has prospered over the years and is today one of Malaysia’s most popular destinations. The museum located at the site chronicles this sad tale and offers actual evidence in the form of newspaper clippings and photos that date back to the time. 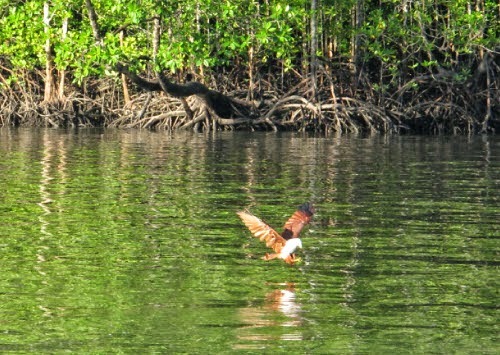 The Sungei Kilim Nature Park is a preserved mangrove swamp located on the northeast tip of Langkawi. Dense mangrove forests, pristine white sand beachfronts and sparkling lagoons dot the landscape of the lush park. 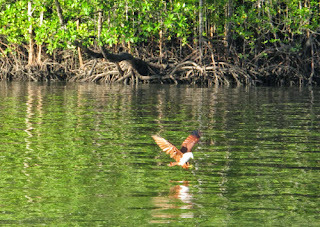 The Sungei Kilim River flows through the park and the banks of the river are inhabited by an assortment of native flora and fauna like tree crabs, long-tailed macaques, white-bellied fish eagles, pythons, monitor lizards, crocodiles and mangrove dingos(small russet-colored creatures who can deftly navigate the dense mangrove swamps). Kayaking trip through the park take visitors past various enchanting sights like ‘Flying fox’ island, an island home giant bats known as ‘flying foxes’ or ‘flying dogs’ because of their long wing spans which can measure up to 1.2 meters and Gua Kelewar (the cave of bats) a grotto used as a refuge by thousands of fruit bats who cling to its numerous stalactites and stalagmites. Other interesting sights include viewings of karst formations, which seem to emerge from the sea bed in the midst of the dense mangrove swamps. These formations sport interesting if not funny names like the Hanging Gardens, the Temple of Borobodur and the Elephant Stone. Langkawi is the name given to an archipelago of islands in the waters of the Andaman Sea. Most visitors to the island tend focus their trips on the largest of these islands, Langkawi, but you can go ahead and explore the many other islands of the archipelago by way of an interesting and exciting island-hopping tour. These island hopping tours lead visitors to the various mythical and mysterious islands of the archipelago like, Pulau Beras Basah, “the Isle of Wet Rice” whose sole inhabitants are monkeys, Pulau Singa Besar and Palau Dayan, an island inhabited by numerous long-tailed macaques which also hosts to the mysterious Tasik Dayang Bunting or the lake of the Pregnant Maiden, a dip in the lake’s crystal-clear waters are believed to cure infertility.